commodity exchanged between settlements and regions, sometimes in multiple directions and covering long distances. Several types of flint mined in the Vistula catchment area were distributed more than 400 km away. flint was mined at Krzemionki Opatowskie in the late 4th and the 3rd millennium. Mining activity at Grimes Graves was concentrated around the middle of the 3rd millennium. The latest of the European flint mines was discovered at the “Zele” site at Wierzbica, near Radom in Poland, where shafts were dug as late as the end of the Bronze Age, around 1000 BC. ....discovery of other similar sites, including Cissubry and Grimes Graves in England, numerous flint mining sites in France, and the Rijckholt – St. Geertruid mine in the Dutch Limburg." Grime's Graves is a flint mining complex dating to the Neolithic period with the earliest evidence of activity from around 3000 BC. It comprises 433 mineshafts, pits, quarries and spoil dumps which survive as earthworks covering an area of 7.6 hectares. It is one of just ten Neolithic flint mines known to have existed in England, of which six still exist as earthworks. The scheduled monument extends over an area of some 37 ha (96 acres) and consists of at least 433 shafts dug into the natural chalk to reach seams of flint. 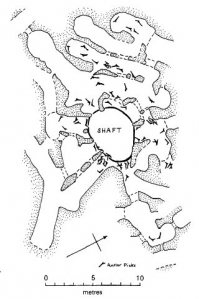 The largest shafts are more than 14 m (40 feet) deep and 12 m in diameter at the surface. It has been calculated that more than 2,000 tonnes of chalk had to be removed from the larger shafts, taking 20 men around five months, before stone of sufficient quality was reached. An upper 'topstone' and middle 'wallstone' seam of flint was dug through on the way to the deeper third 'floorstone' seam which most interested the miners. Once they had reached the floorstone flint, the miners dug lateral galleries outwards from the bottom, following the flint seam. The medium-depth shafts yielded as much as 60 tons of flint nodules, which were brought to the surface and roughly worked into shape on site. The blank tools were then possibly traded elsewhere for final polishing. It is estimated that 60 tons of flint could have produced as many as 10,000 of the polished stone axes, which were the mines' main product. Extrapolation across the site suggests that Grime's Graves may have produced around 16-18,000 tonnes of flint across the 433 shafts recorded to date. 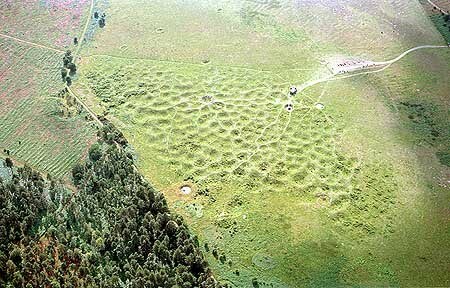 However, there are large areas of the site covered by later activity which are believed to conceal many more mineshafts.